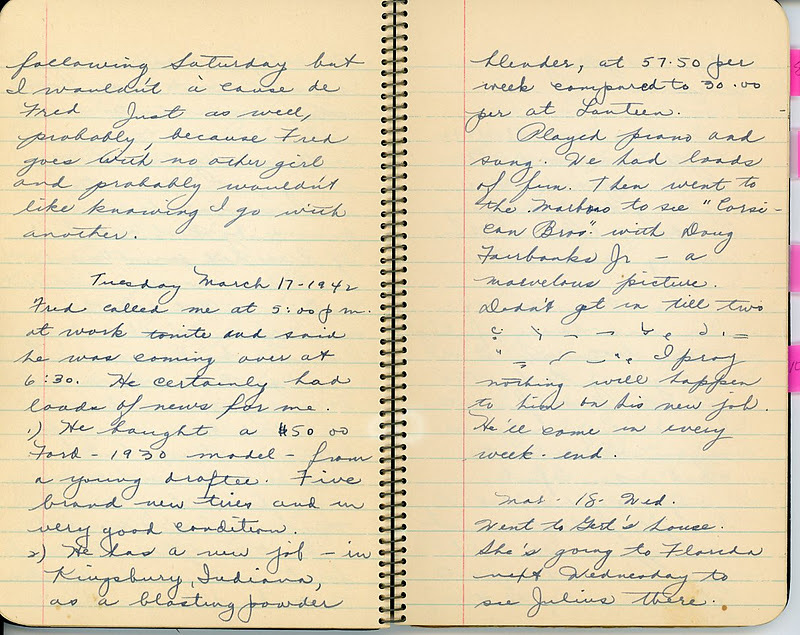 We're following along in the diary of Lillian Koroschetz as she dates two guys: Fred and Burt. Her present quandary is whom she will marry. To start at the beginning of her amorous adventure, click on Falling in Love––70 Years Ago and scroll forward. After being "damn mad" at Fred for not asking her out New Year's Eve, he's back in her good graces--and they've dated just about every Saturday night since February, 1942. Fred called me at 5:00 p.m. at work tonite and said he was coming over at 6:30. He certainly had loads of news for me. He bought a $50.00 Ford––1930 model––from a young draftee. Five brand new tires and in very good condition. He has a new job–––in Kingsbury, Indiana, as a blasting powder blender, at $57.50 per week compared to $30 per week at Lanteen. Played piano and sang. We had loads of fun. Then went to the Marbro to see “Corsican Bros.” with Douglas Fairbanks Jr.––a marvelous picture. Didn’t get in till two. I pray nothing will happen to him on his new job. He’ll come in every weekend. Burt phoned at 6:00 and asked me out. Got in at 4:30 a.m. Terrible, isn’t it? Burt is so grand––such a gentleman, and I do enjoy being with him and also kissing him. I feel like a hussy, kissing both Burt and Fred, and here I am trying to decide––Burt or Fred? It is awful. I love that! She feels like "such a hussy" KISSING two guys. A different era--for sure! I pick up on something in Mom's entries of which she herself seems to be unaware. Burt may be a “gentleman” and a “wonderful dancer,” but he seems like a cardboard cut-out compared to Fred, who's worthy of detail! She's never given Burt the ink she devoted Fred during their glorious summer and fall of dating in 1941. Then there's her concern for Fred's safety as a "blasting powder blender." His cute sense of humor prompts Lil to write, "Gee, I'm in love with that guy!" In the next post: "It came to me like a bolt out of the blue..."
NOTE: This week marks the 101st anniversary Fred's father, Josef Gärtz, began his harrowing trip to America at the age of twenty-one. He left from Transylvania by train on Christmas Eve, 1911. Destination: the port of Bremen. To read a first hand account of one immigrant's travels click: Terror Atop the Train Threats to the Dream, Out to Sea, and Atlantic Crossing in Winter. Or just scroll forward in time. To make a comment, click below either on "comments" or "post a comment." Thanks! I'm loving these posts, Linda! Can't wait for the next! Inquiring minds need to know: is it that you haven't translated the shorthand, or that you want to preserve Lil's privacy? Ah, the Marbro Theater! @Adrienne, those shorthand entries intrigue me as well! They seem to only show up when Fred is around. At least she wasn't kissing them both on the same day,like someone I know! Hello, my faithful followers. Well, I can't read Pitman. I did find a blogger friend who was able to decipher a bit. Sandy Arnone, has a wonderful blog (check it out: http://spittalstreet.com/. Really great content on a variety of topics. She posted an awesome video of Lennon's "And so this is Christmas" that's a joy to watch). Without being able to get every word figured out, it appears that Fred and Lil are engaged in some fairly light (by today's standards) petting. Cute. More Pitman to come--related to treachery against Dad in his new job! Sis, For those who don't know, the Marbro was a super huge theater in Spanish Baroque style, red velvet drapes 30-40' high and seated 4,000! It is hard to conceive its elegance given what we have today. It was gorgeous and impressive to all and filled for "talkies" (sound films) and live performances. I remember being able to get behind the screen and discover "secret" passages between double walls and climb up where I was not suppose to go. Our Uncle Ebner was an usher there ~1940 at 17. I had one of my early dates there and later became an usher myself at a smaller theater in 1962. But times had changed and it was rough with fights & police guards. Paul, thanks for sharing those memories. Yes, now I recall, Uncle Ebner was an usher there--part of Dad's comment "He was a boy of many unitforms." The Marbro was a gem of a theatre. 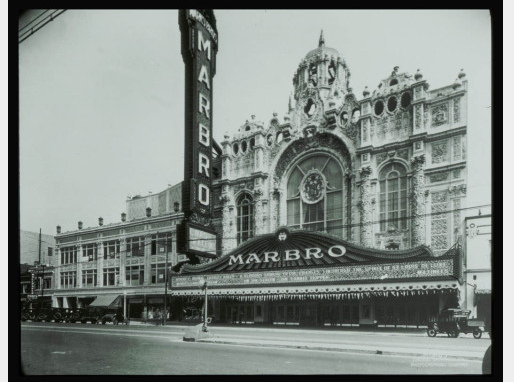 The Art Institute site calls the style: Baroque Revival; Another site says "Spanish Revival" so I don't know if those two styles are related, but just Google Marbro Theatre Chicago and you'll see not only several cool photos, but more than 200 comments from people who remember its heyday and its sad demise along with the neighborhood. I love that your brother is now adding his perspective to the blog. It always amazes me that siblings can grow up in the same family in the same environment and recall so many different elements of the same situation. I'm always looking for the next post. Yes, keep us guessing ~ I think we can all imagine! 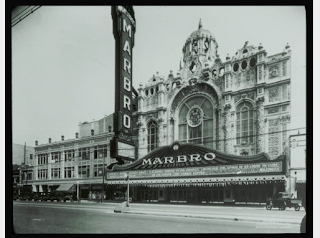 Love the history of the grand old Marbro Theater and your brother's memories. Linda, thanks for reading Tennessee Memories and your intuitive comments about my hubby's dad, Ray. He was a very confident and strong willed man, and yes, I think it showed up in those early photos of him. I want to read this in book format, Linda. 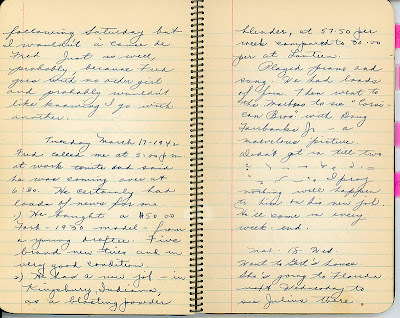 Perhaps once it's all transcribed you can find a publisher like Victoria did for her WWII London Blitz Diary (http://womanlondonblitz.blogspot.com/). I think it's interesting that you know the outcome of her dating two men and now you're able to find about the beginning and middle of the story. 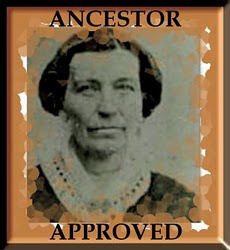 I just found your blog through the Follow Friday at Climbing My Family Tree and I am hooked! I can see that I won't be getting as much accomplished today as I had hoped, as I will be reading through your posts! So glad you found me. I look forward to future visits at both your blog and mine. Whom shall I marry? Indecision is a killer! New Year's Eve, 1941 "Damn mad at Fred"